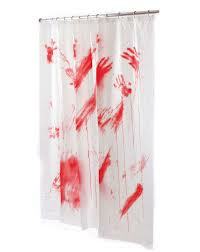 Turn your simple white sheets into a gruesome crime scene. We tried this for a party once and it looked super cool! All you need is some red paint and a plain white sheet. Start by splattering the red paint onto your white linen. Then dunk your hands in the paint and start putting hand prints all over the sheet. You can smear some of the paint on as well. That’s it! All you have to do is let it dry and you’ve got some killer evidence.